A huge crowd waiting to get inside the new Eagle Food Center at its grand opening, October 15, 1958, in Chicago at 6009 N. Broadway in Edgewater. Today, the location is a Dominick's. 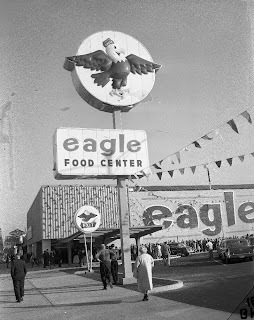 Eagle Food Centers was a chain of supermarkets, founded in 1893 by the Tenenbom family, that operated in Iowa, Wisconsin, and Illinois for a number of years. The company was based out of Milan, Illinois, which is near the Quad Cities of Illinois and Iowa. The company operated stores under many names, including BOGO'S, Eagle Country Market, Eagle Discount Centers, Eagle Discount Supermarkets, Eagle Food Centers, May's Drug and MEMCO. Eventually, the company found that it was unable to compete with other chains, such as Jewel-Osco, Dominick's, Hy-Vee, Wal-Mart and Kroger. The first sign of this was the selling of the Harvest Day bakery plant in Rock Island, Illinois to the Metz Baking Company in 1998. The company went into Chapter 11 bankruptcy in March 2000. In 2003, Eagle Food Stores ceased operations, and sold off its assets. Some of the stores were acquired by other chains, such as Hy-Vee, Kroger, Albertsons, and Butera.